On Thursday afternoon, I watched Friday’s weather like a hawk. By all accounts it would be raining, the question was how much? When Friday dawned and it came time to hit the road towards Pennsylvania for AltRider‘s Conserve the Ride 2013 adventure weekend, I was glad that we would be making the slog in Kenny’s truck. 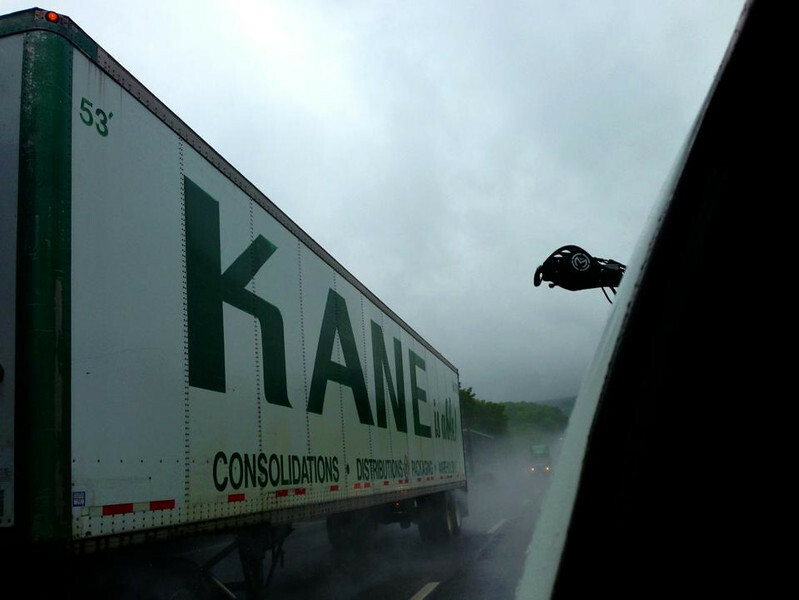 We were traveling out of the soggy clutches of tropical storm Andrea. I cozily drifted in and out of sleep, lulled into dreamland by the steady whoosh of the windshield wipers. 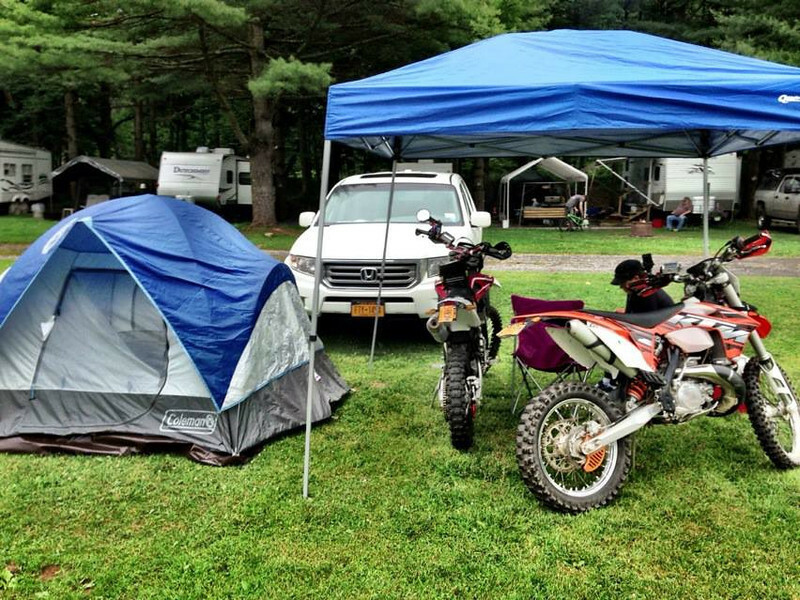 We were both thankful for the dry comfort of his Ridgeline while the bikes got a bath in the bed. When we pulled off of I-80 and headed towards the campground at Woodward Cave, the frog-choking rain that dogged us for 200 miles petered out to barely a sprinkle. The unicorn fairies must’ve been watching my back. They just knew I didn’t want to set up our tent in the rain. Thanks, unicorns! After our initial check-in with the AltRider crew, the evenings festivities were kicked off with a delicious dinner and beer. As a public service, I made sure that I stopped drinking said beer before my verbal filter shut down. Milling around talking with people, I really got a dose of travel envy. People were talking about motorcycle trips through the lower 48, the Continental Divide, Alaska, Canadian Provinces, Peru, New Zealand… *Stamps feet* I never get to go anywhere! Of all of the nice folks we met, Kenny and I really connected with two fine gents from New Jersey – Bill and Art. After much chit-chat, dinner and drinks when it came time to get groups together to ride out the following day, the 4 of us clicked. As Saturday morning tiptoed in with overcast skies, I was greeted by the usual dread and self-loathing about making people wait for me on the trail. I suppose I should have warned Bill & Art that I’m on the pokey side. And scared of everything. But they were patient and funny and all around good guys who never complained. Kenny took one for the Fuzzmop team and hung back with me for most of the day and we just met Bill and Art at the end of the optional sections. Whattayagonna do? It’s not that I don’t know how to ride a motorcycle I’m just… timid and slow offroad. One of these days everything will come together for me and I’ll just be normal. Until then, I’ll just continue to be the little engine that could. 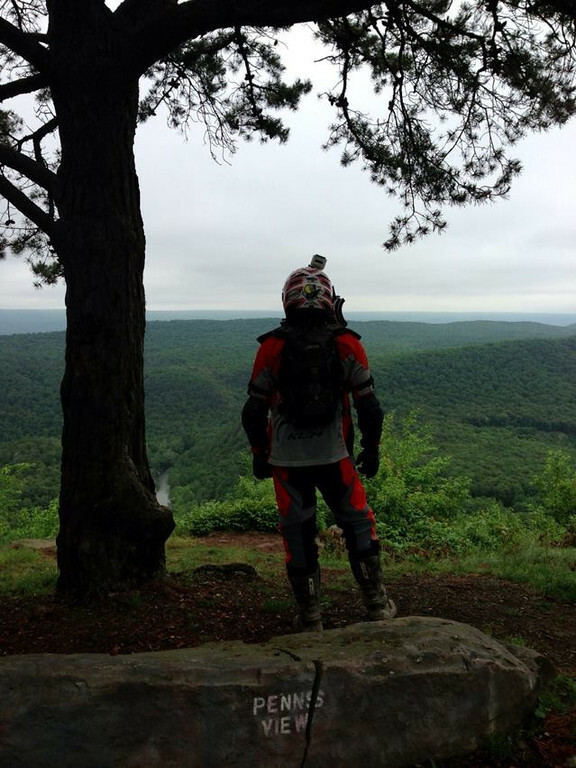 If you’ve never ridden there, let me tell ya ~ Pennsylvania is rocky. All day long you’re jiggled and shaken across the boney terrain. I found my hands had gotten quite tired from hanging on. I only wish that the photos and video would do the surface justice. But, you know how it is – they always flatten out the terrain. 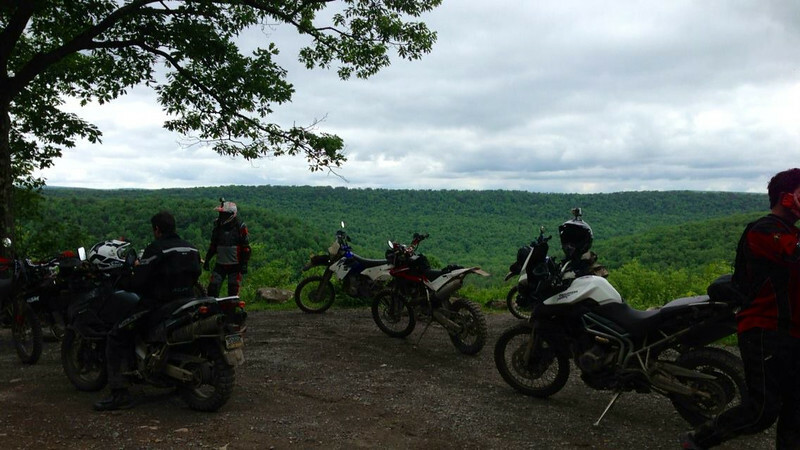 The route set up by the fine folks at the Seven Mountains Conservation Corp (SMCC) for AltRider was a scenic 120 mile adventure ride with 7 optional legs from the main route. 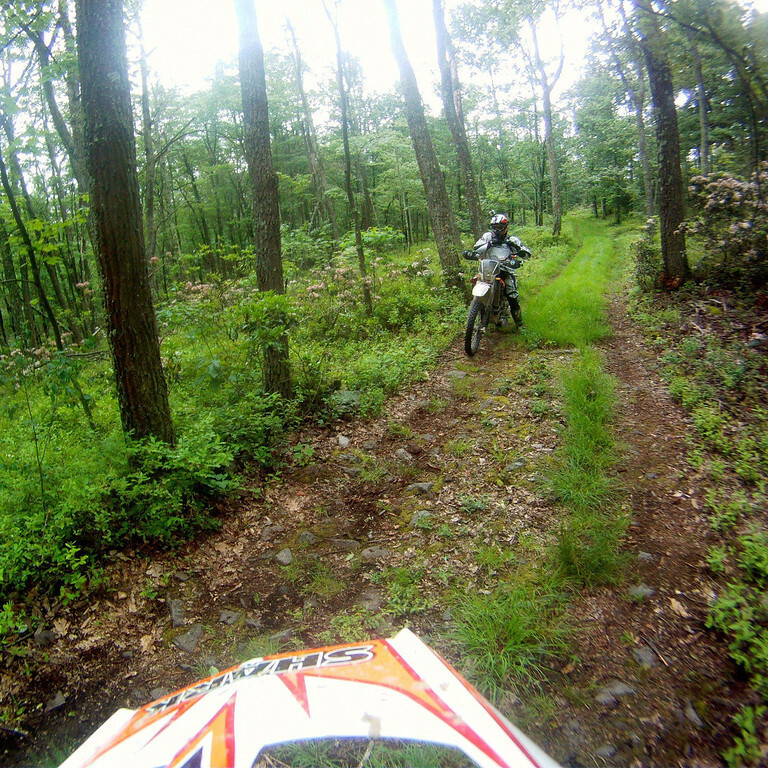 The main route was mostly gravel and dirt roads throughout the Bald Eagle State Forest. It was beautiful and green and featured some wonderful vistas looking out over the rolling mountains. 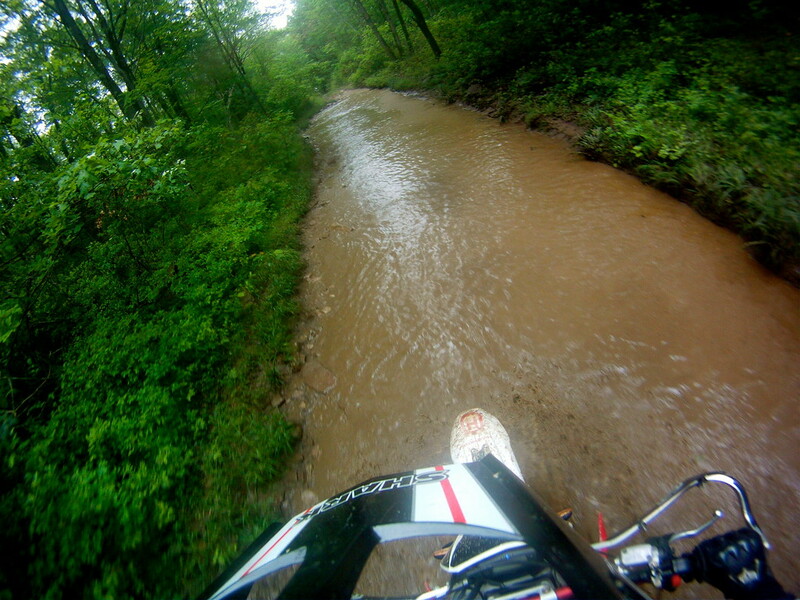 The optional sections of the route gave riders a little more of a challenge with ruts, rocks, mud and water. There were about 85 riders on the ride. Other than when we pulled off at a turn or stopped at the end of an optional section, we didn’t really encounter many other bikes on the actual trails. All of the riding groups were well spaced out. 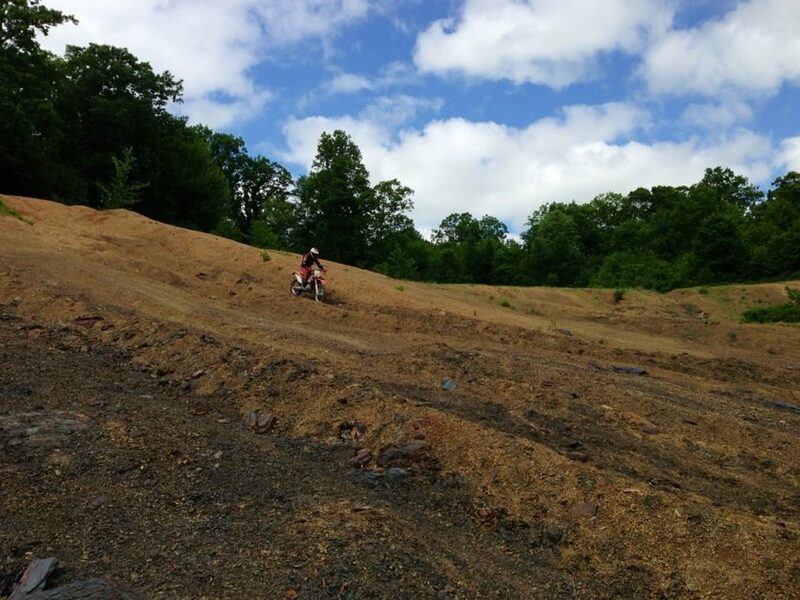 As the ride began to loop its way back toward the campground, some of the riders like my Kenny spent a little time monkeying around in a quarry-like area. After an absolutely great day of riding, the crew returned to camp for a pig roast, more beer and a presentation by Dakar racer Jimmy Lewis. Putting in a full day on the bikes left me feeling so sleepy. Though I wanted to stay up to hang on to that sweet feeling of having a great time a little longer, the sandman was calling my name. I don’t think I even made it until 11pm. 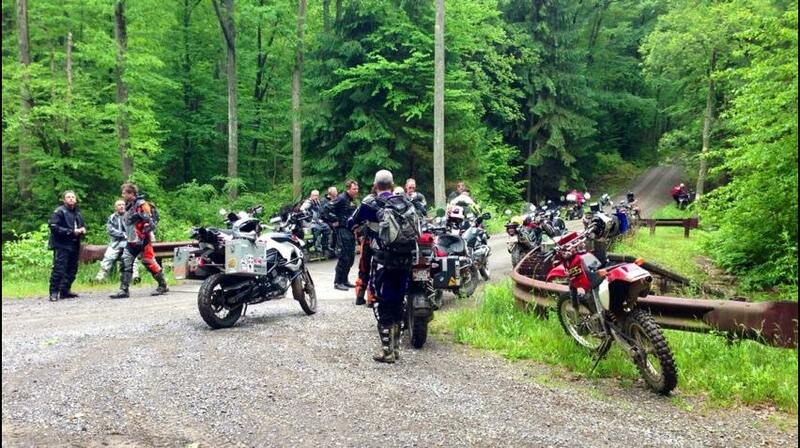 Yes, the riding was fantastic but it was the shared experience with Kenny and our new friends that stays with me. 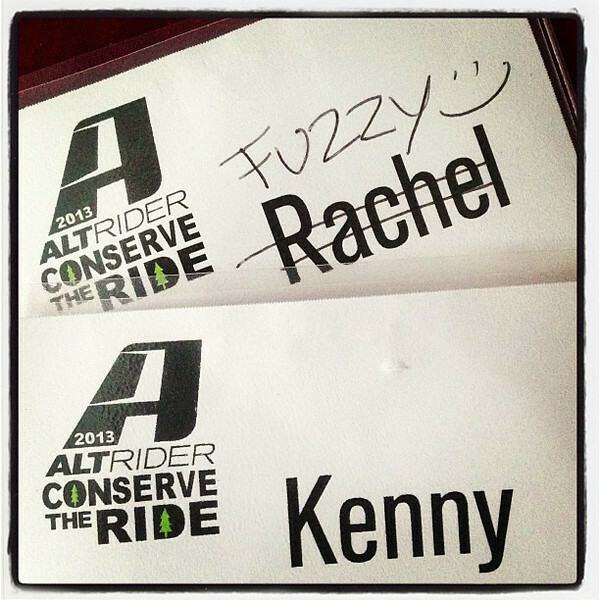 I hope AltRider comes back to PA next year, because I’d love to do it all over again. What an excellent time. I couldn’t make it to this one plus I was still all sore/bruised from the Durty Dabbers the previous weekend. Next year I will make it for sure. Sounds like a great day of riding! It’s great to see they are still running such an excellent ride! 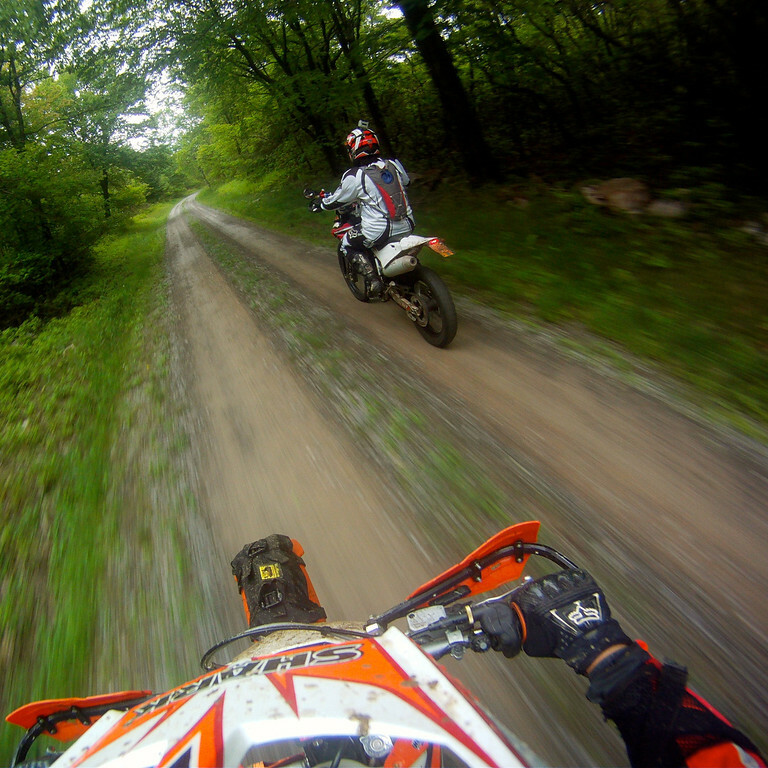 I hope to make it next year it looks like just as much fun as when I took the DRZ. Good times. 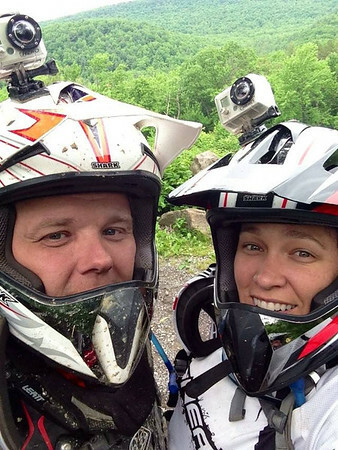 You may have had travel envy of some of the other riders, but you seem to have plenty of adventures close to home. Wow. Awesome pics and great write-up. It looks like it was an amazing experience. 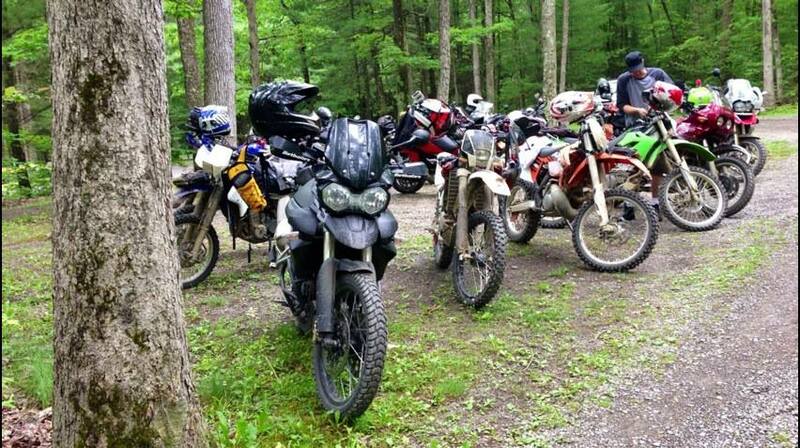 I have been thinking about starting to do some trail riding if only to round out my motorcycle skill set. Any advice on where to begin? Really dig that pic of the two of you, super cute. Ride safe guys!